The hexayurt has become the shelter of choice for many attending Burningman, but there are lots of other great ideas out there for someone seeking to build a temporary shelter. 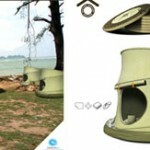 Weburbanist has a great article featuring sixteen different temporary shelter designs. The popup sanctuary shelter is our current favorite. « How Does Hexayurt Tape Compare To 3M 8959?